Paper size: 22.6 x 30.9 cm. Double music sheet (lithograph) published by Senow (Senō Kōyō 1891-1961). The inside shows the music score. This is #44 from a series of 270 music scores Yumeji designed for the Senow Music Publishing Company. The design dates from 1917, this edition was printed in 1924. Very good impression, colours and condition. 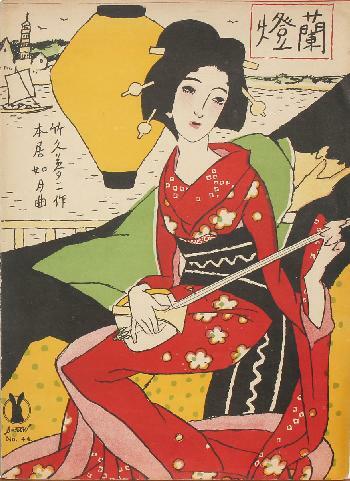 This design was republished by Katō Hanga Kenkyūjo in 1938-9, and is now the cover illustration of Takehisa Yumeji, a publication of the Nihon no Hanga museum Amsterdam (2015).